EXPLANATION - While driving, you cannot use a cell phone or similar electronic communications device while holding it in your hand. If the device is used in a hands-free manner, such as speaker phone or voice commands, that is legal, but never while holding it. 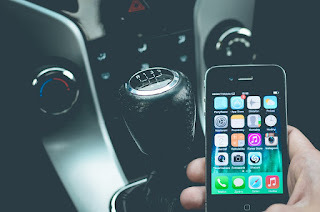 EXPLANATION - The phone or device is placed in a mount attached either on the dashboard, center console, or a seven-inch square section in the lower corner of the windshield farthest removed from the driver, or in a five-inch square section in the lower corner of the windshield nearest the driver. The mounting or device placement cannot hinder the driver’s view. EXPLANATION - While driving you can single swipe or tap the screen while it is in the mount in order to activate or deactivate a feature or function. This is not meant to allow multiple taps or swipes such as texting or scrolling. EXPLANATION - After fees and penalty assessments are added the stated base fine, the ticket will actually cost at least $162 for the first offense and at least $208 for the second offense. Thanks to Corporal A. Bostrom, Pomona Police Department, for taking the time to prepare this handy quide!